To be released July 2019.
by William Ribas, Ph.D. and Carol Ann Gregory, M.S. What do evaluators need to know and be able to do to be effective? What structures do districts need to have in place to insure effective teacher supervision and evaluation that raises student achievement in all of its schools? How do districts develop a supervision and evaluation system that raises student achievement? The book contains hands-on, easy-to-use templates. It is filled with sample documents from districts that are implementing effective teacher supervision and evaluation. 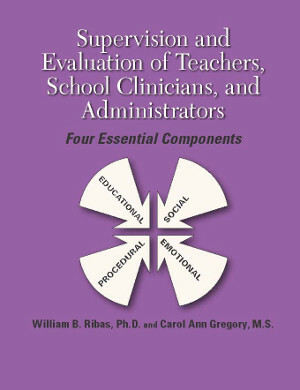 It contains everything a district needs to transform teacher supervision and evaluation into an effective program for raising student achievement.